Notice the leaf area that has been eaten. In the Tugen Hills north of Kabarnet, Kenya. Dec. 2015. Host plant appeared to be Tarchonanthus, Ateraceae. Grasshoppers are mostly agile insects that are wary and ready to jump or fly at the least hint of danger. 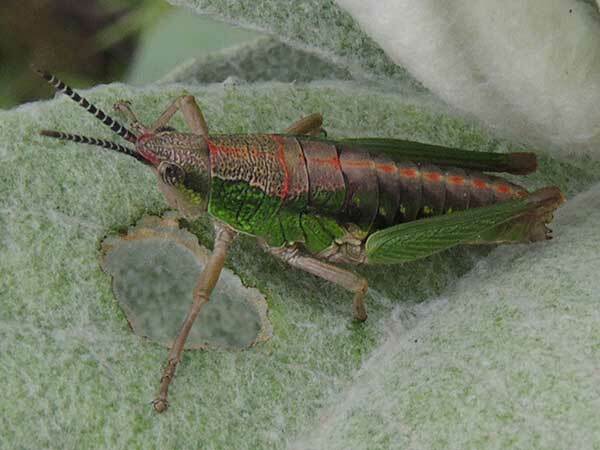 Gaudy Grasshoppers abandoned this strategy for avoiding being eaten by instead sequestering noxious chemicals from their food plants in combination with tough and often sharp body armor. This species feeds on toxic leaves that livestock won't browse. An insectivore that ignores the warning coloration will get a mouthful of unpleasant chemical and will maybe release the insect altogether. This insect is feeding on new growth of Camphor Bush, a nutritious, but also a difficult food to process. First it contains toxic compounds as dose the whole plant. Because the leaf and stem are growing rapidly their protein and nutrient content are higher than usual. Perhaps this is why a dense coating of hairs are deployed. For sure the hairs shield the new tissues from damaging ultraviolet light, but also it could deter herbivory. Imagine chewing through a thick layer of tangled fibers before reaching softer leaf tissue. Somehow these hoppers have mouthparts specialized for dealing with this defense. Because the hopper is defended against predators it can feed more slowly and take time to process the toxic chemicals as well as the physical barriers.